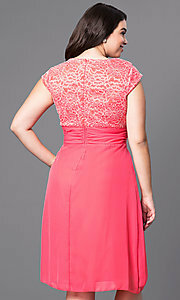 Here's a plus-size party dress that flatters the figure. This designer dress by Sally Fashion, offered in misses and plus sizes, is ideal for dinner parties and wedding celebrations. The floral-lace bodice has a v-neck and cap sleeves. Layers of soft chiffon drape beautifully with an asymmetrical panel from the ruched empire waistline to the knee-length hem. Priced reasonably under $100 for semi-formal events, this knee-length party dress provides affordable elegance.